I had hoped to be writing to you freshly off a new food trial for carrots, which I had no doubt would be a success. As you can see from the picture above: no carrots. Which is a bit misleading. I did begin the carrot food trial, but for about the past 5 weeks, something has been making me severely sick. It was the same thing that would happen to me a long time ago when I had given up almost all fructose except for wheat. I thought perhaps it was almond flour (which I had just learned has fructans), so I gave up my almond bagels, but the sickness persisted. It seemed that once every four days I would be stuck in the bathroom with waves of stomach cramps so bad I thought that surely the ordeal would kill me. I went back to the G.I. and it was not a reassuring experience. He told me that the hydrogen breath tests used to diagnose Fructose Malabsorption are not very accurate and he “wouldn’t be surprised if [I] didn’t have Fructose Malabsorption.” I let myself get excited for a minute until I remembered some of my previous experiences. He also wondered why I was not eating wheat–he told me I could probably start eating it again. I then had to explain to him the whole “fructans thing.” It was the same place that diagnosed me! How could they not know anything?!!! He told me to add a fiber supplement to my diet (Benefiber, he said, not Metamucil). I rolled my eyes but have done just that for the past 3 days. And even though I still got sick this morning, it was waaaay less intense than before. So I’ll stick with it for a while. Otherwise, I have an appointment set for next month at the Mayo Clinic (for once I’m glad to live in Minnesota). Anyway: carrots. The soup looks sad without them, but doesn’t taste sad at all. 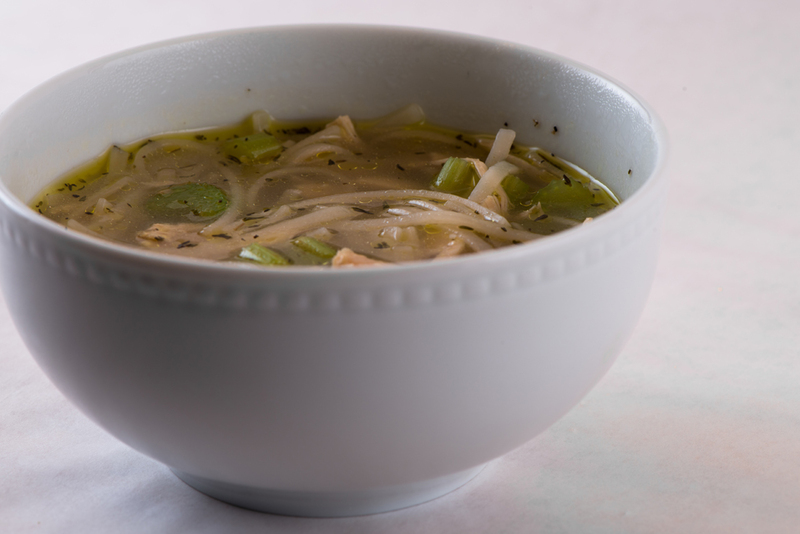 It tastes amazing, and I think everyone with Fructose Malabsorption should have a chicken noodle soup recipe on hand (except vegans/vegetarians, of course). Unfortunately you have to start this one right away in the morning if you don’t have any chicken stock you can tolerate from the grocery store (I haven’t found any yet), but it doesn’t require much attention. And making the actual soup is a breeze. Make your Whole Roasted Chicken and Chicken Carcass Stock first. Be sure to start early in the morning (by this I mean 11:00). When you are finished with the hard part, wash your celery and carrots and chop them up in 1/2 inch pieces. Place them in your pot along with the olive oil, thyme, basil, peppercorns, and bay leaves over medium heat. Stir occasionally for about 6 minutes. Add in the chicken stock and bring to a boil, then turn down the heat to let simmer for 5 minutes. During this time you can make sure your chicken has been pulled or chopped into bite-size pieces. Add the chicken and let simmer for 5 minutes. Break up your rice noodles into 1-2 inch pieces and put in the pot. Let simmer for 5 minutes. Serve. Add in salt and pepper to taste. The more salt the better, I say. This entry was posted in Recipes and tagged carrots, chicken, chicken stock, fructans, fructose malabsorption, rice noodles, soup by nosugarlessgum. Bookmark the permalink.